Can one have a split personality? One of me is a trained academic historian, researcher and teacher. Make sure you read widely about your subject, research the primary sources but don’t be afraid to be critical. For example in 1858, two of the witnesses to a Parliamentary enquiry into Irish Female Immigration claimed ‘4,000 orphan girls were brought to New South Wales between 1850 and 1852’ which we now know is bulls…. Rumour masquerading as fact. Think about your subject, weigh things in the balance and for goodness sake, don’t plagiarise ( i.e. present other people’s work, words (even phrases), ideas, illustrations, as your own. That is intellectual theft.) All my colleagues told their students, plagiarism could mean their being awarded no marks at all. And now what do I see in the ‘real’ world? Plagiarism is rampant. Parents write their child’s school assignments and teachers reward them! Media journos borrow/steal a report from overseas and read the report on air as if it were all their own work! Students even pay to have their essays written for them! The other one of me wants to get inside the head of our Famine orphan adolescents: but they didn’t record their thoughts and experiences. To do so, I’d need the creative genius of writers like Evelyn Conlon (author of Not the Same Sky) or Jaki McCarrick (who wrote the play Belfast girls). As Evelyn said, fiction writers just make things up if they need to; they aren’t shackled to historical fact. Writers often make an impact because their work has something to say about present-day concerns. As a trained historian, I’m naturally wary about this. If a student wrote, “workers in the Industrial Revolution were alienated because they had no television to go home to”, I’d comment ‘you’re not being historically sensitive here. That’s anachronistic. You’re too present-minded’. In other words, I’m ‘conflicted’. I’ll have misgivings about imposing what I know of 21st century adolescents on young Irish Famine women of 160 years ago. Or transferring my own experience of family life to families in the past. “Do ye see thon Biddy Mahon. She said that I said you’d said she was a ….”, “how long do we have to be on this [insert swear word here] ship?” I was tempted to use ‘effin’ but I’m not even sure what swear words were common in 1848 0r 1849 or 1850. Still, nothing ventured, nothing gained. I’d be grateful for any suggestions. Maybe you have a female orphan ancestor. What kind of voice do you think she had? How did she react to the voyage? to her shipmates? to Matron and the Surgeon Superintendent on board? or the sailors? What words would you use? Let me give you a taste of the voyage to OZ. What am I doing writing about long sea-voyages to Australia? There’s plenty of sailing in my family history I’m told. Not here; my two attempts are not exactly covered in glory. A colleague and I set sail from Port Royal (or what’s left of it after the 1692 earthquake) in Kingston Harbour, Jamaica on two occasions. On both we had to be towed back to shore by fishermen. Mind we only had a jib. 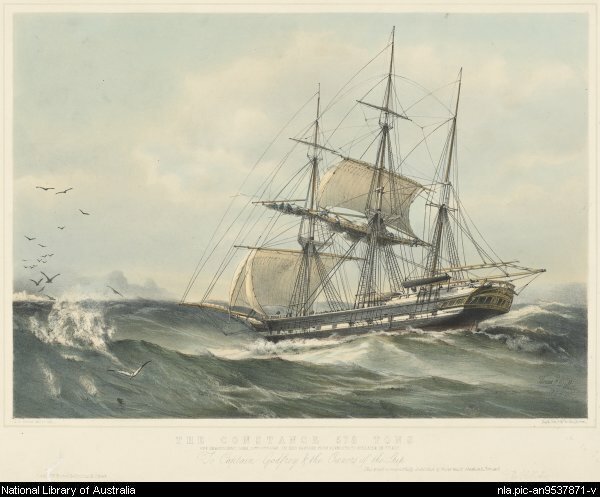 Here’s a painting of a ship coming on an unusually rapid voyage to Australia in 1849, reproduced with the permission of the National Library of Australia. The artist was Thomas G. Dutton and the picture is from the Rex Nan Kivell collection. I’ll say more about this particular voyage a bit later. If I’d been on this one I’d be swearing too. This entry was tagged Earl Grey orphans, Evelyn Conlon, Government Assisted migration to Australia, Irish Famine orphans, Irish Famine orphans to Australia, Jaki McCarrick, The Constance. Bookmark the permalink. Hi Trevor, I am currently researching the Earl Grey Emigration Scheme as part of my undergraduate research at Queen’s University Belfast. I was wondering if you would know the document in which the Orphan committee informed the British government that the Irish orphans were finding it difficult to find employment and as a result the scheme should be suspended. Many thanks, Sarah. Have yet to see it myself. But it looks good. A good many of the orphans must have been at least bilingual, a bit like our children in detention. I have looked at the lives of six Earl Grey Orphans in the past few weeks, and have contributed some information to the Famine Memorial through Perry McIntrye. I must admit, in a few of the cases I really felt like I knew these girls personally. I felt many times that they were guiding my research. I am not sure that the mind set of the Famine Orphan girls is that much different to those of my early female convicts, or my other orphans who came outside the Earl Grey Scheme,and perhaps a different approach might be considered. All the young Irish women and girls suffered the same trauma and feelings of displacement, be they orphan or convict. Good to see people thinking about this Narelle. Were the six you’ve worked on all affected in the same way? And if we could eavesdrop what sort of thing might we hear– “Och look at that poor wee dear; she’s sobbing her heart out. Go and comfort her Mary Black. Ah not you too…. “, something like that, perhaps? Please don’t be offended by my reply Trevor. I feel very deeply for these girls and the thousands like them. Young girls sent to Australia to work under terrible conditions. Paid way less than girls from England or Scotland, all because they were Irish. In some cases these girls had even been deserted by their own parents who were just unable to feed them. I can’t imagine the pain the parents suffered too. My interest in the Famine Orphans started with what I believed, was an error in the information supplied to you, and recored in Barefoot and Pregnant. I have since been able to look deeper into the lives of three other girls with the same name as the one who interested me. I feel to try and put words into the mouths of these girls would be a total injustice to them. I would never presume to imagine for a moment what they might have said or felt…..if indeed they allowed themselves to feel anything. Did they have a choice in being sent to Australia ?….I think not. I have read often…”the girls selected” or “the girls listed for emmigration”…..never have I read, ‘ the girls applying’ or ‘the girls requesting’. I have just finished reading the book ‘Not the Same Sky’ by Evelyn Conlan and while I enjoyed the ‘novel’ very much, I was disappointed I was not brought to tears as I have been with just researching the lives of some of my Irish ancestors sent to Australia. Perhaps my feelings are still a bit raw on this subject at the moment. Who knows what the future will bring…I might just try to put myself in the shoes of a 14 year old girl, dying and destitute, hungry and cold, alone and scared……perhaps I will be able to give her a voice. Regards Trevor, and thankyou for the amazing effort you put into Barefoot and Pregnant (1&2). I treasure my copies. Very thought provoking Trevor. My orphan ancestor’s voice was reported in the Goulburn Penny Post in a court case against her husband. I wonder how much has been lost in translation – how accurate was the memory of the court reporter, how ferocious was the editors pen?